Firstborn by Lorie Ann Grover. Review: Imagine a world where the live you live is a lie. That is exactly what teenager, Tiadone has to go through. She has been untruthful to her friends, community, and her commanders for years now. Suddenly when she gets a bird to lead her, she wonders if this a sign of destiny or evil? Will she survive her life as a male or will she fail? Find out in the smash-hitting book Firstborn by the award winning author, Lorie Ann Grover. Tiadone at birth was declared as a male, because her parents only had two choices; leave her to suffer out in the woods or raise her as a male. As she was raised she had to give up her female traits and learn how to be a male. As she grew up and learned the ways of a male, she received a bird and eventually hatched the bird and named it Mirko. As seen by her parents, they found Mirko as a sign of good luck, and destiny. However, Tiadone gets visions of her bird and fears it is asign of evil. When its time to fulfill her duty as a male and head to camp to learn how to defend her community; will she make it? At the camp she doesn't find it easy, keeping her female traits to her self as easy as it use to be. She finds herself struggling to keep her secret. With all of the new skills she is learning she seems to be doing fine, but everybody has a close eye on her. When she seems to find a close friend at the camp, she is starting to be drawn to him in ways that shows her female traits. Upset, puzzled, and so much more, will she be able to find her true destiny and stand up for her rights? Or, will she not make it and eventually have to die because of her actions? Find out in the fantastic book Firstborn. Firstborn is a marvelous book. I could never put the book down it was too fascinating. I hope Grover makes a sequel to this terrific book. I know that just by looking at the cover, boys may find this book unappealing. However, you should give this a try and you might find out that this book is amazing. 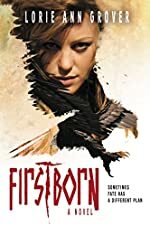 Firstborn has an excellent exposition and plot, is very creative and has realistic characters and an ending that will leave you wanting more. It has a blend that will appeal to all genders. For the boys, it's the fact that there are a lot of boys in the book. So even though it is told through the eyes of a girl, boys will enjoy her experiences. Everyone can also relate to the problems that Tiadone faces such like family relationships and struggling with her identity. Grover also leaves the audience with a mood of wanting and thinking more about the book. She leaves the audience with some good questions that extended far from what is in the book. This book would be best for 5th to 8th grade students because it has a lot of vivid words and complex ideas. Younger readers might not be able to understand what is happening in the book. I recommend Firstborn to middle school students who would want to try something new and be immersed in a cruel world where living a lie is essential for survival. After reading Firstborn, you'll be dying to read more! We would like to thank Blink for providing a copy of Firstborn for this review. Have you read Firstborn? How would you rate it?